The Oregon Department of Transportation warned that traffic will move slowly for several hours as trucks that were holding make their way through the still difficult driving conditions. Drivers are required to carry chains. PORTLAND, Ore. — Westbound Interstate 84 in the Columbia River Gorge reopened Wednesday evening after a crash the night before caused a miles-long backup and left drivers stranded for hours. Twenty miles of westbound I-84 had been closed after several semis wrecked about two miles west of Hood River. Prior to the freeway reopening, trucks stuck in the closed-off area slowly made their through the area on Wednesday afternoon to clear the road. ODOT then removed ice packs with plows and put salt and deicer on the road. Thousands of drivers spent the night in their parked cars along the freeway, and are concerned about running out of gas. They weren't able to get out of their cars because the conditions outside were dangerous. ODOT officials didn't communicate overnight with drivers involved in the backup, but tweeted Wednesday morning they were working to get everyone off the highway at Hood River. 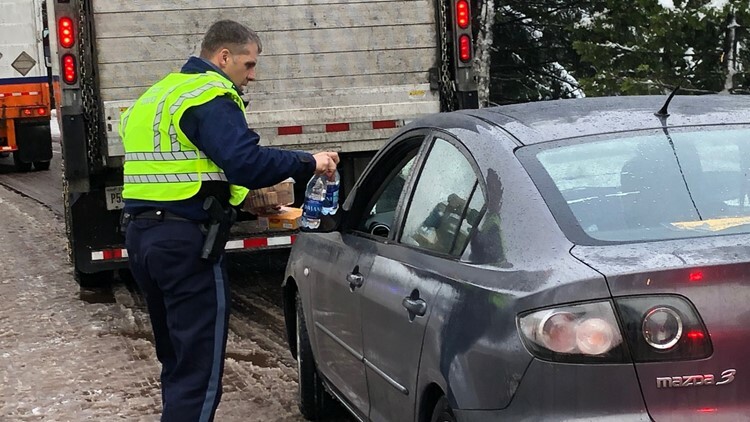 Meanwhile, Oregon State Police troopers handed out food, water and fuel to stranded drivers. Kevin Taylor was traveling back from a ski trip when he got stuck in the backup. He spent more than 12 hours in his car, and said he didn't get information from ODOT or any police agencies about what he or other drivers should do. ODOT officials admit it was "an awful situation and we apologize to everyone caught in this." ODOT said it pre-treated the area with deicer, sand and salt, but "the Gorge's unique microclimate and multiple microburst snow and ice storms lessened the impact." "We are about to run out of gas so it’s starting to look iffy, and I’m sure a lot of other people are too because who was prepared for this?" Mariana Wallig, a driver who was stuck in the mess, told KGW News. She sent an update just before 4 a.m., saying she had made it to Cascade Locks. Eastbound I-84 lanes through the Gorge remained open Wednesday, but driving conditions were severe with slick lanes. I-84 was previously closed at Troutdale on Tuesday morning, after several semi-tractor trailer trucks crashed around 2:30 a.m.
As one westbound lane was opened around 7 a.m. near Corbett from the first crash, another crash on westbound I-84 at Bonneville Dam closed all westbound lanes yet again. All lanes were back open by 4 p.m.